First of all I would like to thank all the doll collectors who have contributed pictures to this website. I could not have made it without all these wonderful pictures. I'm not affiliated with Annette Himstedt or her company. I'm not selling dolls either. If you want to buy a doll, please look for retailers in the links section. This website is for informational purposes only. The pictures on this website are courtesy of their respectful owners and have all been used with permission. The promotion pictures and the pictures within this website's design are courtesy of Annette Himstedt. No copyright infringment intended. This website's design is made by My Arts Desire. I hope you enjoy this website as much as I enjoy making it. 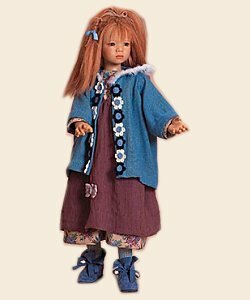 If you have any pictures of your Himstedt dolls in their original outfits and want to share, please e-mail them to me or post them on the forum. We can never get enough pictures of these precious dolls.